The Genetic Genealogist Named a Top Blog for 2013! Thanks to Miriam at AnceStories, I learned today that The Genetic Genealogist was named one of the 25 Top Genealogy Blogs by Internet Genealogy! 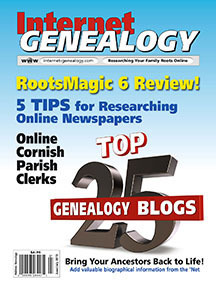 Congrats to Miriam as well, who was also named one of the 25 Top Genealogy Blogs. Miriam has a list of the other 23 sites on her blog. Blogged: 25 Top Genealogy Blogs to Help Speed Your Research! Tony Bandy highlights twenty-five blogs you can dig your teeth into. I’m honored by this, and I think it reflects the increasing interest in DNA and Genetic Genealogy that genealogists continue to express. We’re approaching a critical mass at which point DNA must be part of every genealogists’ toolbox, and at least a consideration in any serious genealogical search. This honor follows not long after yet another incredible honor, being named one of the Top 40 Genealogy Blogs for 2013 by Family Tree Magazine! I was included in the “Tech support” category along with some other great blogs. Actually ALL of the blogs listed are great blogs, and I’m proud to be listed among them. I recommend that you check out each of these blogs and determine which ones you should add to your daily reading! Congratulations…and I will check out the others.